Garden Seeders – Which Is Best for You? Since we’ve introduced the NEW Hoss Garden Seeder in 2015, we’ve had many people contact us to ask which of our Garden Seeders, the NEW Hoss Garden Seeder or the Wheel Hoe Seeder Attachment,will best work in their vegetable garden situation. Both Garden Seeders have the same innovative Seed Plate design, hopper and brush assembly. This Seed Plate design makes our Seeders the most versatile on the market because of the ability to customize the Seed Plates to match your seed size and your desired seed spacing. Although they have the above similarities, there are also distinct differences between the Hoss Garden Seeder and the Wheel Hoe Seeder Attachment. The Wheel Hoe Seeder Attachment is designed to attach to our Wheel Hoes, while the Hoss Garden Seeder is a stand-alone unit that is strictly for garden planting. Another primary difference between the two Garden Seeders is the furrow openers that open a space in the soil for the dropped seed. The Seeder Attachment has a furrow opener that consists of a solid plate of metal called a “shoe.” This shoe-style furrow opener works great for planting in a firm, clean seed bed. It doesn’t perform well in situations where there are high levels of undecomposed organic matter in the soil. On the contrast, the Hoss Garden Seeder has a rolling coulter or double disk furrow opener that rolls along the soil, opening a furrow for dropping seed. The rolling coulter furrow opener on the Hoss Garden Seeder is more forgiving in a wide variety of planting situations, including high levels of organic residue. The final difference is that the Wheel Hoe Seeder Attachment has a short, wide rear packing wheel while the Hoss Garden Seeder has our 15″ steel wheel. The wide rear packing wheel on the Wheel Hoe Seeder Attachment performs well on a firm seed bed. If you have really fluffy soil or you till your garden before you plant, we recommend using the Hoss Garden Seeder. While the Seeder Attachment has been one of our most popular products for several years now, we designed the Garden Seeder to be more versatile in certain growing situations. 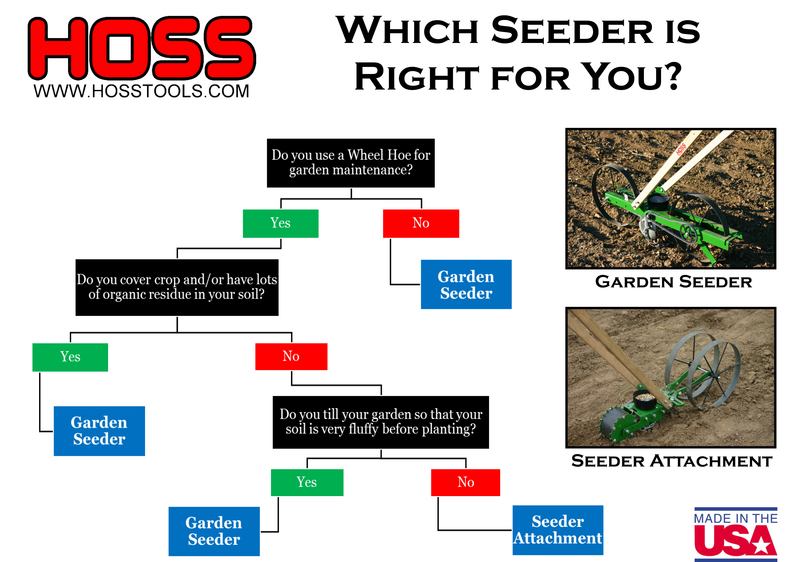 Click on the graphic below to see a flow chart that will guide you to decide which Seeder will work best in your garden.